Two weeks old is generally too young for a full bath. While puppies generally shouldn't get full baths before they are 4 weeks old, that doesn't mean you can't clean them until then. 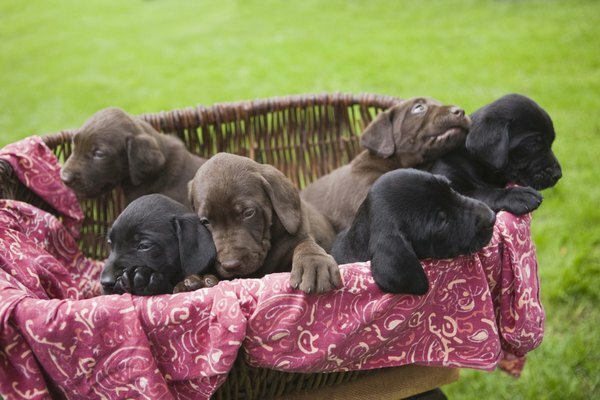 After all, puppies get dirty with the best of them without ever leaving the birthing box. The key is to be gentle and to mimic a mama dog's cleaning techniques to keep your puppy fresh. Heat the room. Puppies, especially those as young as 2 weeks, are more sensitive to temperatures than mature dogs. If you're going to clean yours, the environment you do it in shouldn't be cool. Dampen a soft wash cloth or hand towel with warm water -- not hot water. Wring it out a little so it's moist but not sopping. Rub the warm, moist cloth against his face in short, circular motions. Be gentle. The cloth is essentially standing in for his mother's tongue. Rinse out the wash cloth to dampen it with some fresh warm water, then repeat the process you just completed at the opposite end of your pooch. Since puppies have little control over their bathroom habits, he might be a little messy toward the back end. Just wipe him clean with the warm, wet towel like you did with his face. Dry him gently with a warm towel and reward him with a treat -- this helps him develop from a young age a positive association with your cleaning him. If your two-week-old is particularly dirty elsewhere, like around his feet or legs, wash him off with the warm, damp cloth in the same manner you would his face or privates. While puppies this young may be able to tolerate a full bath, the notion isn't universally accepted, so giving him wash cloth baths like this until he's at least 4 weeks old is your way of playing it safe. Are Kittens Born With Worms Like Puppies? When Will Puppies Go to the Bathroom Without Stimulation? Do Old English Sheepdogs Get Along with Cats? What Kind of Soap Should I Bathe My Puppy With?